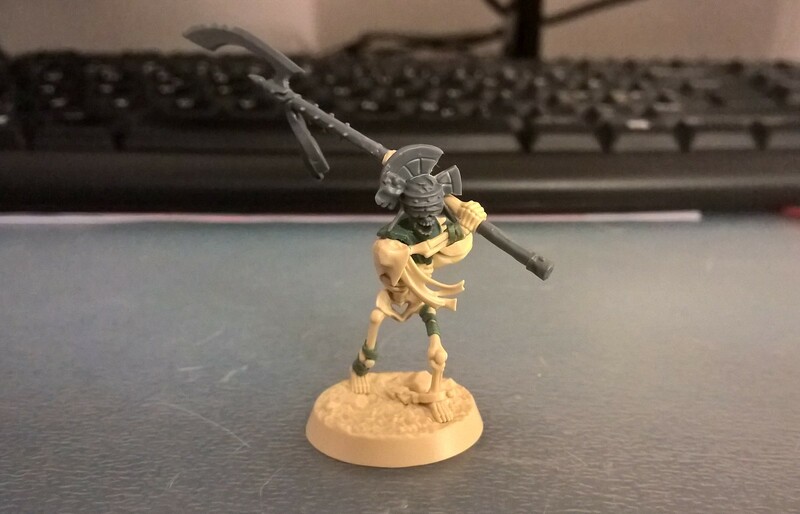 "Something else stalks the cursed sands of Shadespire..."
Hello everyone, welcome to my new project log! 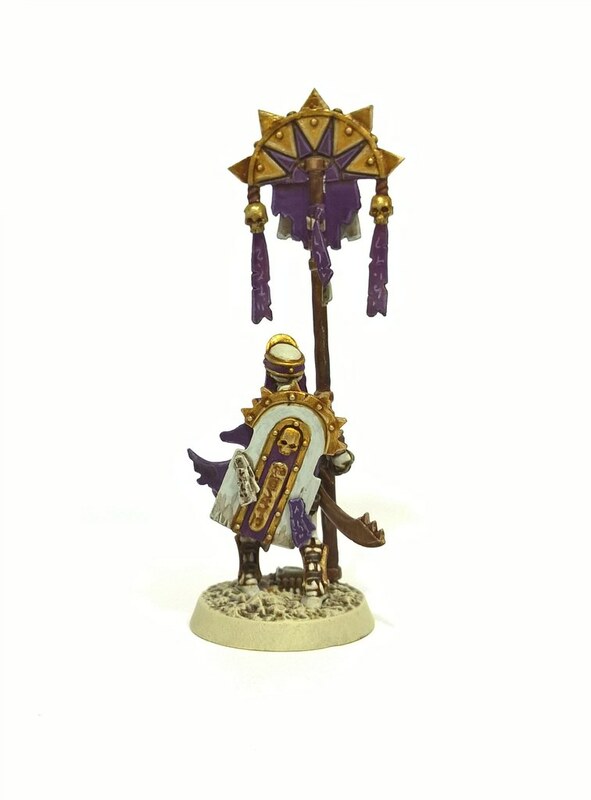 INSPIRATION: I wanted to do conversion of Sepuchral Guard for a long time but I was lacking inspiration. This have changed when I was playing AC: Origins. 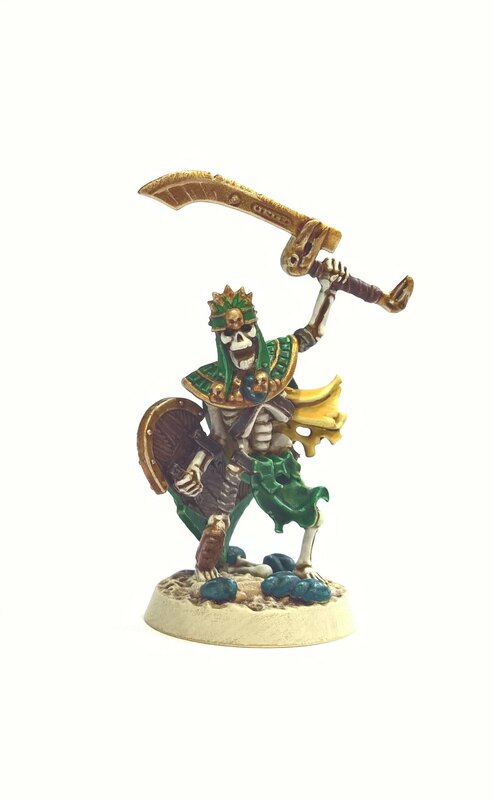 I love Egypt and I love Tomb Kings though I have never owned any TK models before. 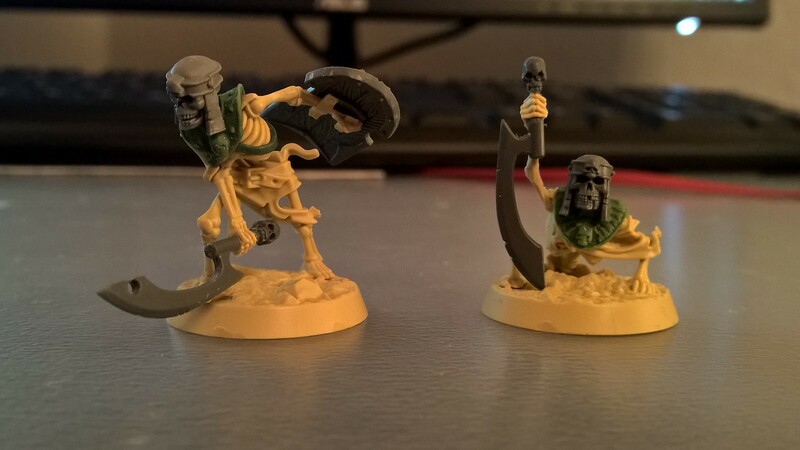 GOAL: Convert Sepulchral Guard models (weapon/head/ shield swap, adding TK details) to Tomb Kings warband. 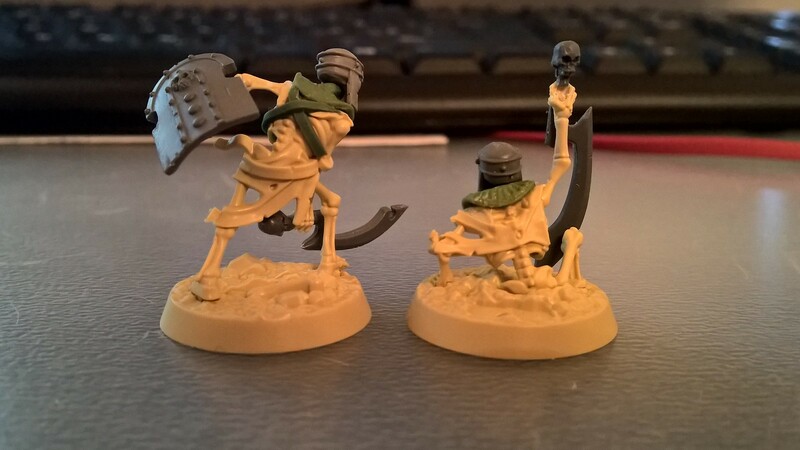 Here are first two models of Skeletal Legionnaires. Still WIP but you can get the idea Comments are welcome! 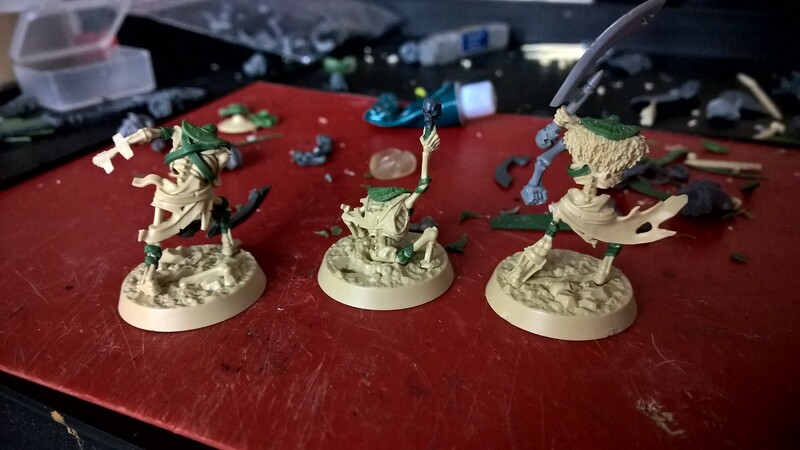 I fninalized third skeletal legionnaire and added bandages from green stuff. 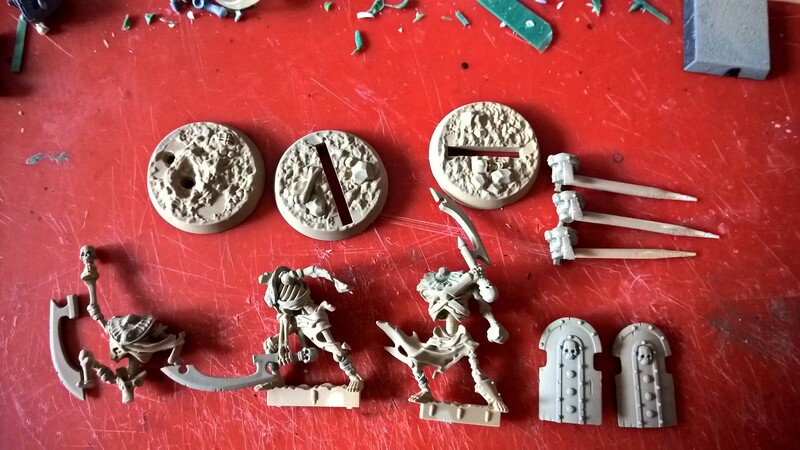 Models are primed and ready for painting. 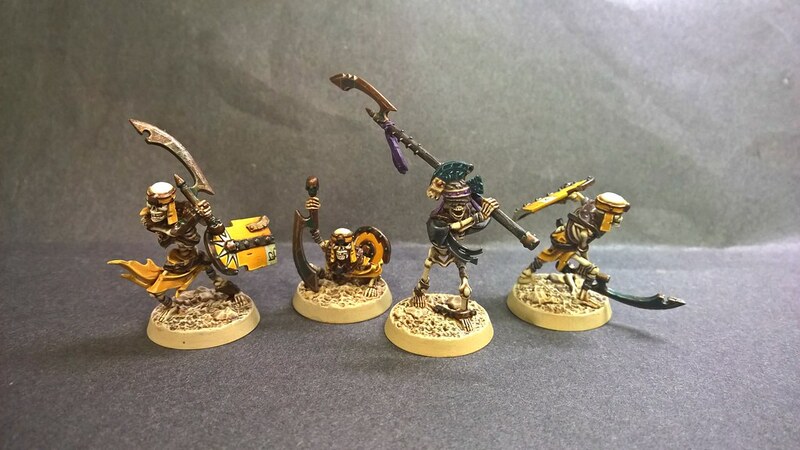 I wanted to go for classic blue/gold scheme but instead I will do my own yellow/white combination with bronze/metal details. 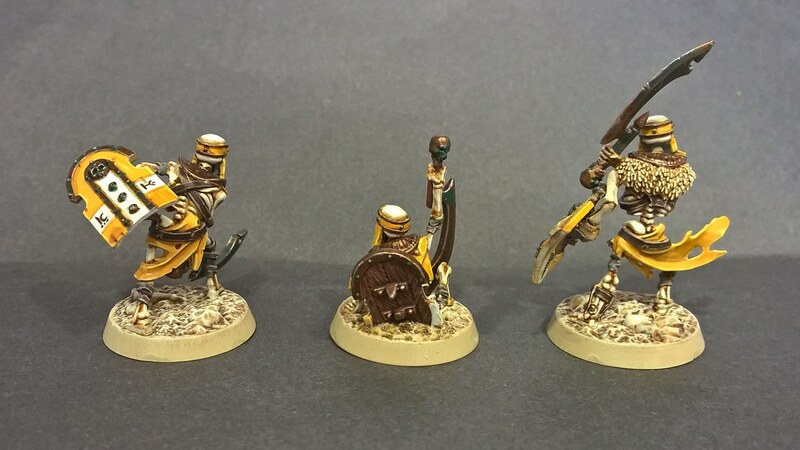 Small progress on warband. Quite satisfied with the result. The bronze part was a bit tricky to get it right. Sorry for bad lighting in the photos. Too yellowish. 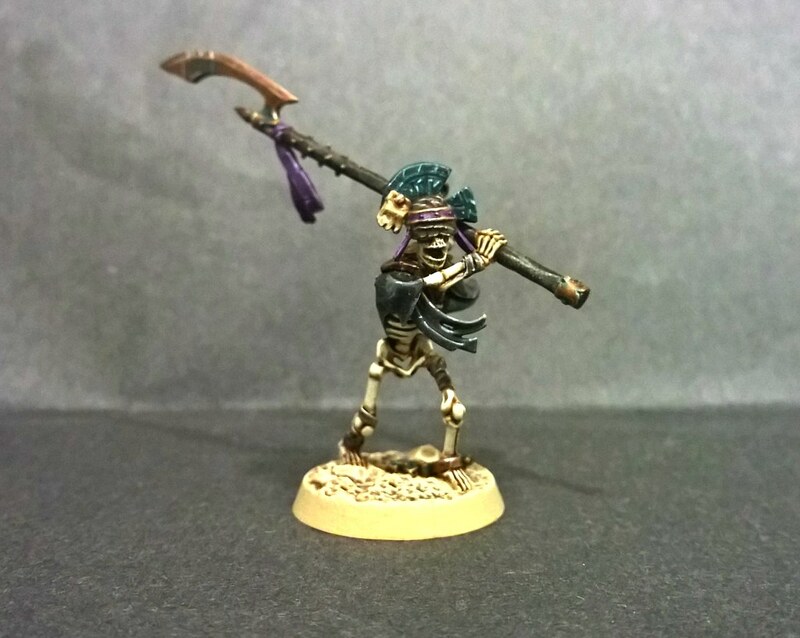 Finished member of Mortuary Cult, Harvester of Duat. 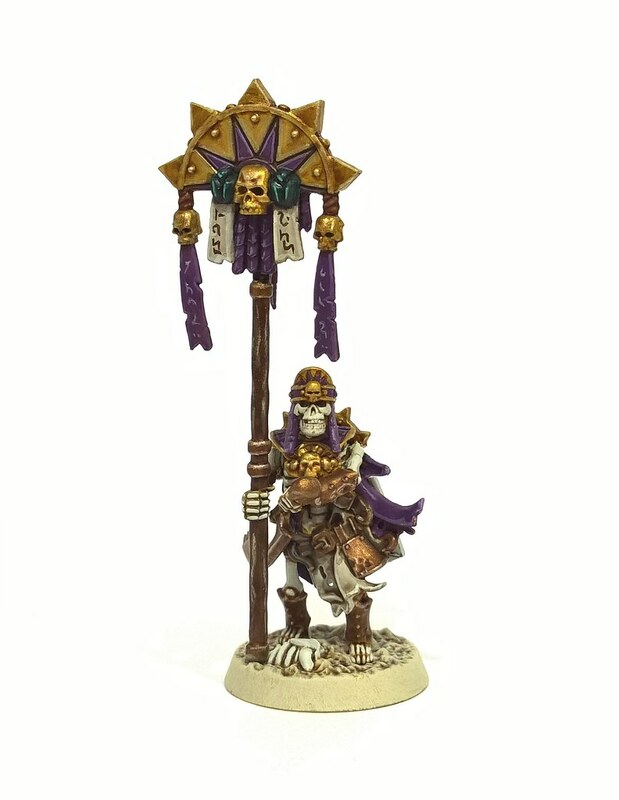 Switched the colours a little bit to represent another branch of Tomb Kings. 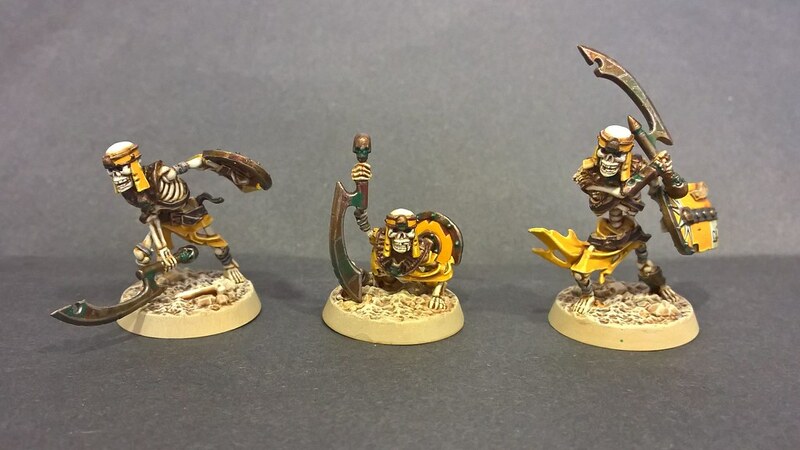 The colours will be also reflected to last three models. Quite satisfied with the results so far though I will try to improve on "marble" effect. 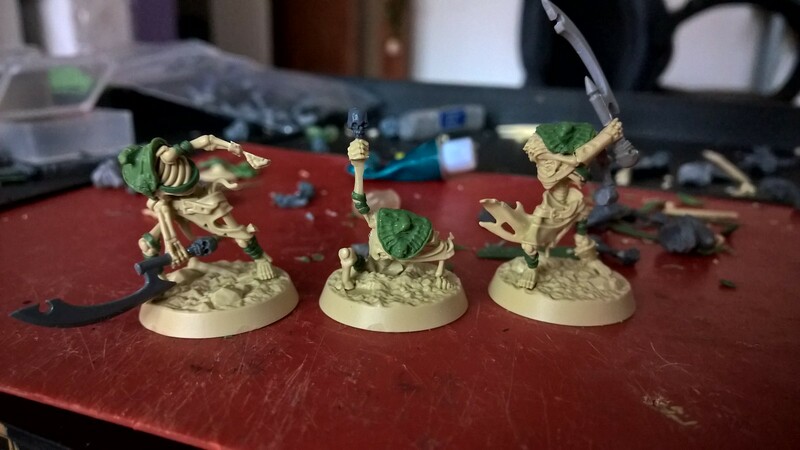 So I converted next two models. 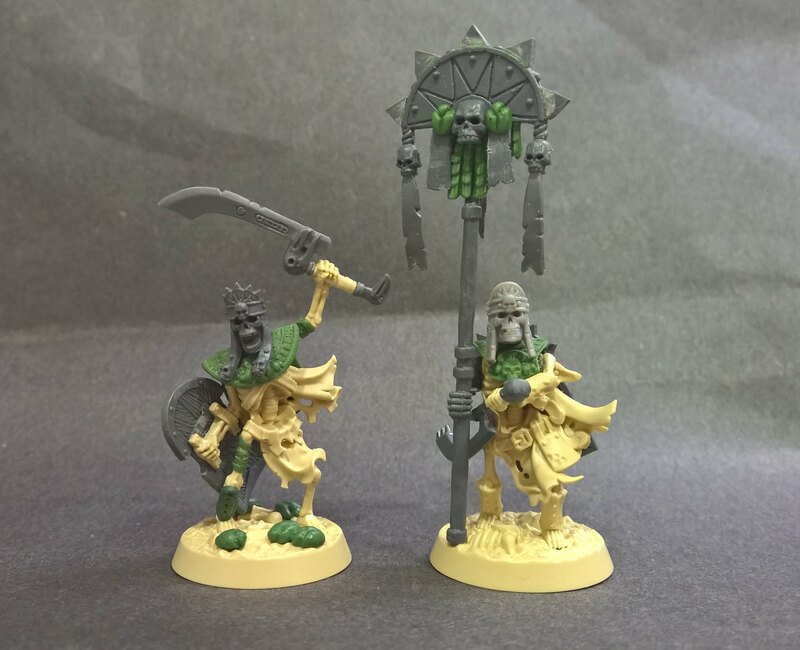 Scarab Prince and Tomb Herald. 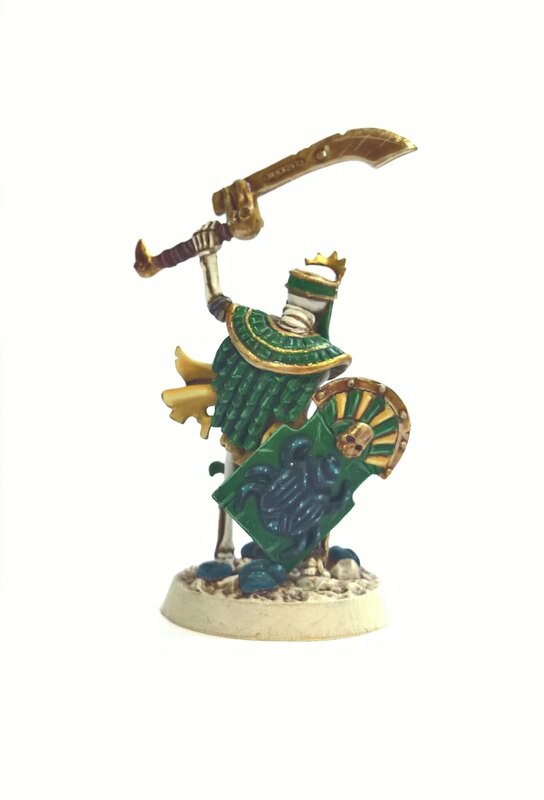 Scarab Prince was really pleasure to do as it is great pose miniature and I had just the right bits for him. Herald was a little bit tricky with the hands but I made his left hand as unsheathing the weapon. 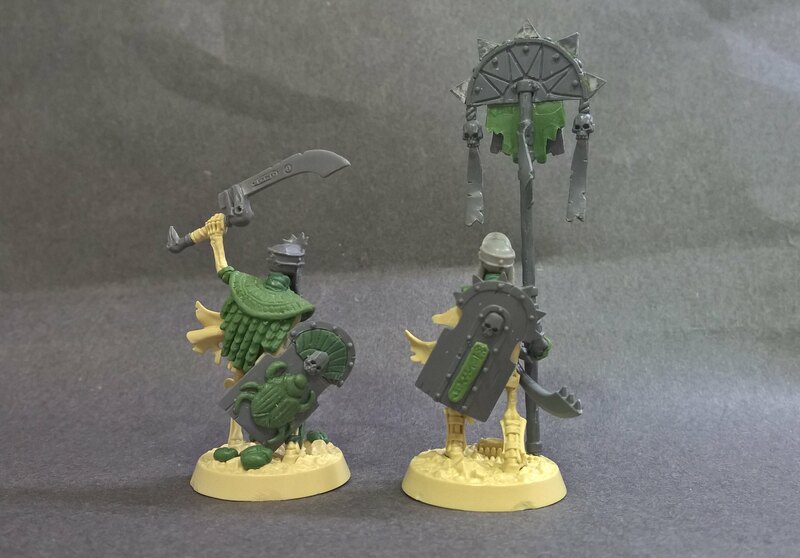 I like the highlighting on the scarab shield.